Photo Credit: Rebekah Marine, the bionic model. We’re gonna share our love-themed promotions, books, social posts and other relevant stuff you might enjoy on this post. It might get updated a couple of times. Heartbreaker is a black humour story that deals with love and heartache. A love story with an alien princess visiting Earth. Read Girl Gone Nova. A love story between an older man and a cheeky young woman. Read Slow Up. A story of unrequited love. Read Gorgonise Me. A teenage love story in a dystopian world. Read Dronehunter now. A coming of age LGBT love story in a cyberpunk world. Read it now. A new adult love story in the middle of a technothriller. Read Nanodaemons Now. Just like we said on our End of the Year Course Correction post, we’ve published two titles in paperback format! And we do what we say dammit, even if it’s only half the time. The Girl Who Twisted Fate’s Arm on Amazon. Watcher’s Web is an exciting survival story set in an alien wilderness. She is lost on an alien planet. He said he’d help her get home. He lied. Jessica’s plane develops engine trouble over the dry Australian inland—and crashes in thick, unfamiliar rainforest. A group she thinks is a search party shows up, but it consists of large-eyed not-quite people who kill all survivors except Jessica and a long-haired hippie named Brian. No one is going to come to rescue her. In fact, they’re not even on Earth. While the pair wrestle their way through the forest in search for help, Jessica becomes ever more suspicious of Brian. Why does he know so much about the world where they have ended up? Why is he so insistent on helping her? Jessica has always been able to use her mind to tell animals what to do and now she’s hearing voices in her head. Another man is pleading her not to listen to Brian. Except this man can kill someone with a single look, and he uses his mental powers to order people around. In this utterly strange and dangerous world where people seem to want something from her, who can she trust? A gritty survival story in the vein of The Hunger Games, set in a Star Wars locality. The rich and powerful tapestry of world building captures the imagination and just doesn’t let go. The characters are full of life and complexity. I thoroughly enjoyed this story. It is easy to identify with the peoples and through suspension of disbelief, this world was very real, as are the struggles being faced. Love books that make me think about what I would or wouldn’t do in that situation. Great strong female lead. Hollywood, are you listening? This story should be made into a movie! Avatar, move over. There’s a new kid on the block! This story is well written and the characters have plenty of depth. The story flows from one page to the next, from one chapter to the next. It keeps you on the edge of your seat from page one til the end. Find the entire series on Amazon, or visit the author’s page for links to other retailers. I’ve already bought Oathbringer and Artemis. Of the rest, Persepolis Rising is definitely on my list. David Wong’s “What the Hell Did I Just Read” is also on there, I loved the last book. Ann Leckie has no chance of ever getting my time, ever again. The Book of Dust is getting passed around all the time in my social media echo chamber, so I’ll give it a shot. What else should I add to my TBR pile? I love a good space story. And there’s nothing better than J.J. Green’s series, Shadows of the Void. Starbound is the prequel to the fast-paced, action-packed Shadows of the Void space opera serial. Being a Martian isn’t all it’s cracked up to be. Jas Harrington was only a baby when a massive fire at a fledging Martian colony took the lives of everyone close to her. After growing up in institutions on Mars and Earth, Jas travels to Antarctica to train as a deep space security operative. All she wants is to graduate college and fulfill her dreams, but it isn’t long before she faces familiar prejudice against returned colonists. For once, fighting her way out of her problems isn’t an option, until it is. Looks great. I wanna read it. Alternatively, you can sign up at J.J. Green’s newsletter and get Starbound for free. But won’t she mind if I do that? Nope. Because then J.J. can send you even more exclusive stuff. Just get on the spaceship right now. Wait. I can binge on that series? Start reading the Shadows of the Void series on Amazon. We have a shop, where you can browse or buy our stories directly from us. Read. Whispersync. The wonders of technology. Then get cyberpunked. We actually prefer that you buy from the major retailers, cause that gets the algorithms rolling. But for various reasons we have the same stories available on our site. In the future, we will offer variant covers that will not be available on any retailer. Regarding Kindle Unlimited titles: We are experimenting with KU distribution. That, called Kindle Select, has an exclusivity clause that prevents us from even selling on our own site. Only Amazon stores are allowed. We generally don’t like that but as soon as the titles shift out of select we will update the products here. We now accept cryptocurrency. Complete your checkout as normal, and you can choose from Bitcoin, Litecoin, Ethereum or Monero. Send us an email at mythographystudios@gmail.com after sending payment to verify the transaction and get your files. We don’t actually celebrate Halloween here in Greece. But, in a clear case of culture seepage from Hollywood, we do have Halloween parties! Even though we don’t actually have a festival of the dead, the roots of such celebrations are from the ancient Anthesteria, which was a 3-day festival honouring Dionysos. On the third day, the Feast of Pots, cooked meat and fruit were left outside for the souls of the dead. No one dared touched them, they weren’t for the living. And when the day ended, they called out loud for the spirits to begone, that the Anthesteria was over. 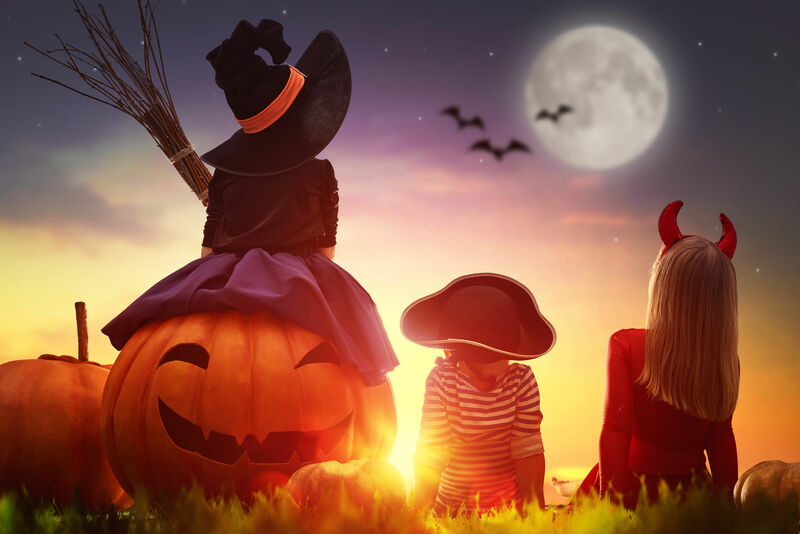 In modern times, the only thing close to trick or treating is kids going for Christmas Carols. And we dress up in our Carnival, or Mardi Gras, which is another Dionysian leftover. People dress up in either silly or scary costumes during that celebration. So yeah, we don’t actually have Halloween but there has been cultural cross-pollination, and we do have scary events and parties on October 31st. Any excuse for a party, really. But the trick or treating is left to the ghosts. Here’s a short story set in the God Complex Universe. It takes place on Halloween night, at a party, in Athens. When a young man from a village comes to the big city to study, he finds himself overwhelmed by the urban lifestyle. But will he manage to blend in by going to a Halloween party, when his crush asks him to help decorate the place, when the abandoned villa becomes all too spooky for him and when the illusory masks everyone wears seem to never come off? Yeah, I noticed the trend and it bugs me a little. No, people, dystopian doesn’t mean post-apocalyptic. Post-ap is something after a major catastrophe, dystopian means Orwellian surveillance nightmare. You know, kinda like the God Complex Universe. Sometimes the two genres overlap like in the Hunger Games, but one does not necessarily mean the other. 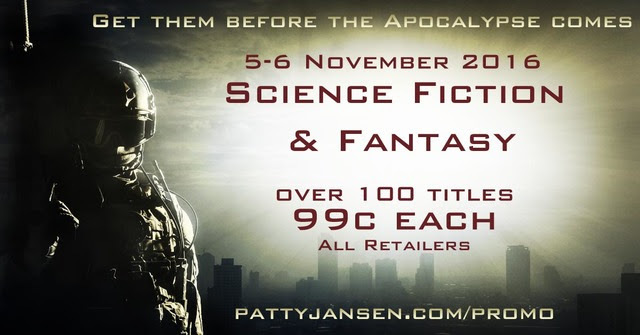 Anyway, here are some grim and post-apocalyptic books for you to choose from. You’ll find all that, and most importantly, you’ll find it across all major retailers. Yeah, we’ve made it the norm. Any shop you prefer, we’re on it. First weekend of November only, 5-6 Nov. Get ready cause it’s closing in fast. Samhain is the original version of the Halloween celebration. We’ve got a cool giveaway running, in which you sign up for the Mythic Fiction Promos, choose a book from the listed mythic series and comment on the Facebook post below. What are you waiting for? 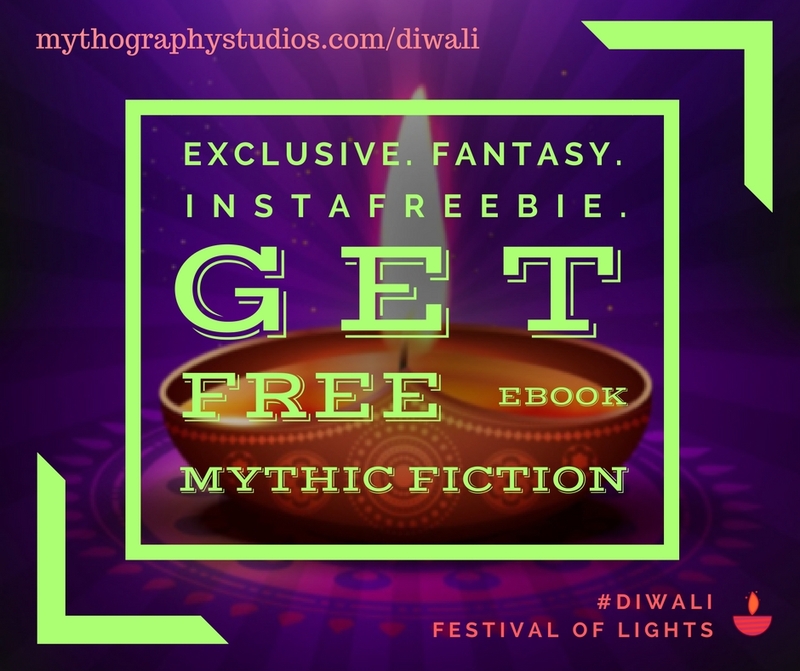 Celebrate The Festival Of Lights, With Our #Diwali #Instafreebie Promotion! Instafreebie is a website that connects readers with authors, providing sneak peeks, advanced access, special giveaways, and exclusive freebies. All you have to do is browse for titles you think you’ll enjoy, sign up with your email and select the filetype that fits you, Mobi, ePub or PDF. Instructions for loading that file in your e-reader will be sent to you from Instafreebie. By signing up to receive a book you understand you also agree to be contacted by the author. The promotion is organized by Mythic Fiction Promos, a curated list of mythic fiction standalone books and series. Explore the page for enchanting new books to read and join the mailing list to get notified in time. Here are three selected titles on offer. There are plenty more to choose from!